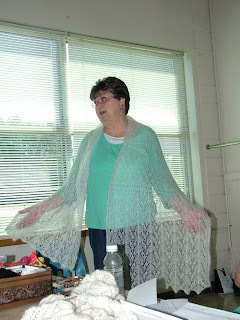 Pat reports her brain cells are back! 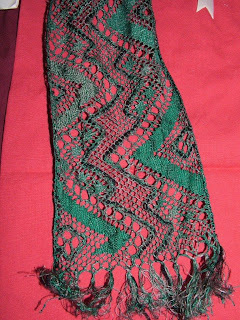 She used them on this lovely knitted lace shawl (baby mohair and silk on size 7 needles). 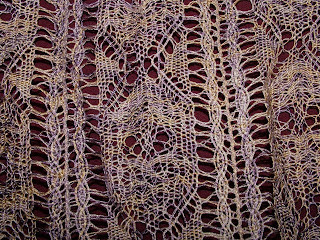 Helen's finished--finished! 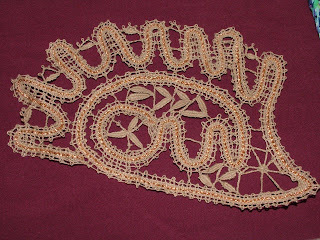 Bedfordshire (bobbin) lace cuff. 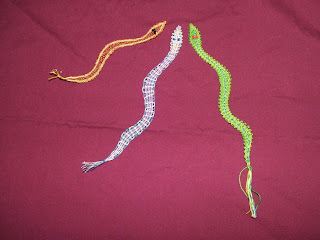 No word on the likelihood of its partner being completed. 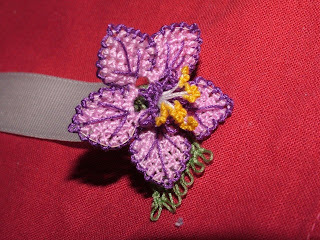 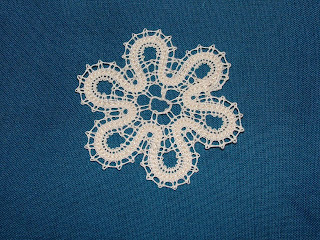 Helen showed off her bebilla (knotted lace) flower book mark, made by Elena Dickinson. 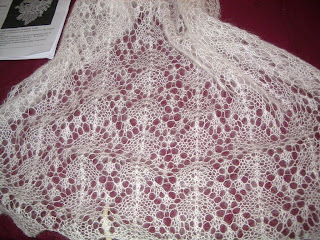 Alice's showed her silky torchon (bobbin) lace shawl. 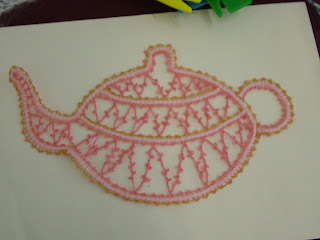 Margaret's dainty bobbin lace teapot. 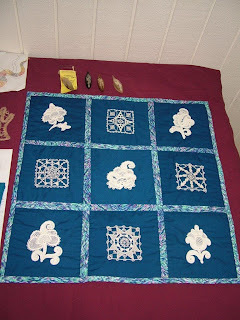 Helen's mum brought her needle lace sampler quilt, with gros point and reticella in Gutermann silk. 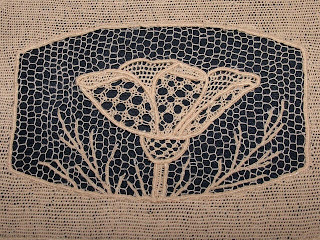 Kathy showed her finished hedgehog, noting her progressive improvement in the tallies. 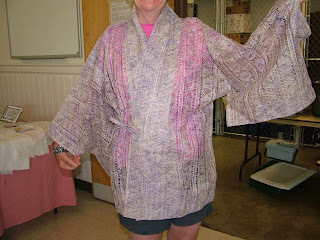 Kathy also showed a Japanese kimono in machine-imitation bobbin lace. 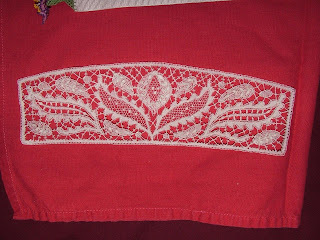 Delores brought her Russian tape (bobbin) lace sampler. 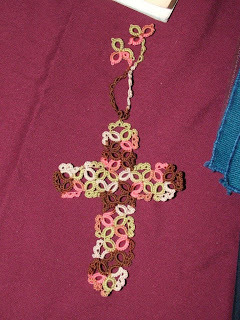 Holly's multi-colored tatted lace cross. 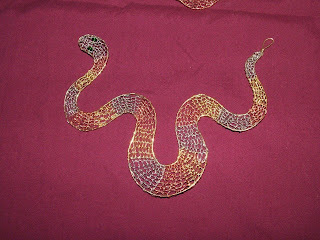 Sharon's spectacular wire needle lace snake. 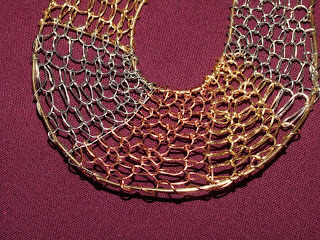 Sharon's wire needle lace snakes. 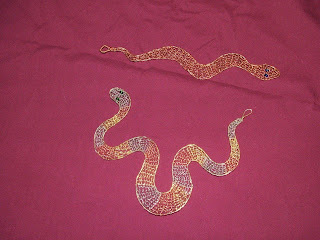 Sharon's bobbin lace snakes. 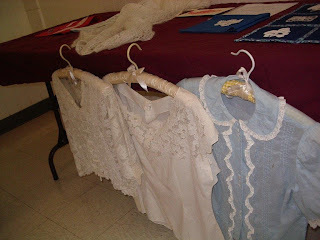 Beth brought some lace-trimmed blouses hand-sewn by her grandmother.